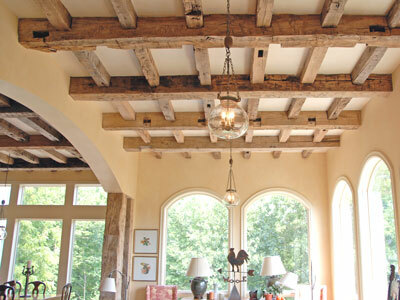 Whether you need wood for flooring, millwork, furniture, fireplace mantels or exposed beams, you can add instant character to your home by installing reclaimed and restored lumber. These antique pieces of wood, some species no longer available, are very strong and stable. This wood is typically sourced from historic buildings, barns, factories and mills. We can conserve our precious natural resources by utilizing reclaimed wood and reducing our demand for newly milled wood products. You’ll find rich Chestnut, Heart Pine, Rock Elm, Oak, Hickory, Heart Cypress and other hardwoods that’ll transform your living spaces into extraordinary rooms. To maintain the earth-friendly quality of the wood, have it finished with low-VOC or no-VOC (harmful volatile organic compounds) products. It’ll also keep your indoor air quality clean. The following companies offer reclaimed wood products, some re-milled and ready-to-go. I’ve included the state the company originates from, but most service other areas as well. Elmwood Reclaimed Timber, Missouri, not only offers cabinet lumber, flooring and beams (pictured above), but also countertops, tabletops and stair parts. Green Waste Recycle Yard, California, diverts local urban woods (not antique wood) from landfills and transforms them into dimensional lumber, flooring, table tops, countertops, landscape timbers, mulches and biomass fuels. Morningside Reclaimed Woods, Pennsylvania, supplies beautiful high quality old growth lumber, weathered reclaimed barn wood, wide plank flooring, paneling, trim and beams throughout the east coast. Mountain Lumber Company, Virginia, offers beautifully crafted lumber that has been de-nailed, sawn, kiln dried and pre-finished (pictured here). Superior Hardwoods and Millwork, Montana, offers hand-hewn timbers, lumber, flooring and decking. Find other reclaimed wood companies in my previous post on the subject. Thanks for the ideas here, particularly for the low-VOC finish. Keep up the good work and looking forward to reading more of your posts. There are quite a few companies in the Pacific Northwest that offer FSC certified reclaimed wood. Such as Viridian, Windfall and Endura. If you’re in the Pacific Northwest they are definitely comapanies worth checking out! Reclaimed lumber/wood is a great alternative in our more environmentally aware culture if you can find someone that has that option for whatever your wood based project is. I know over at GuitarGuardian.com, while we have a large selection of different types of wood for museum quality, custom built guitar display cases, we have yet to have a customer ask about reclaimed wood, but it might be worthwhile for us to look into that as an option to present to customers as they typically are thinking about features like adding a humidifier or LED lights and not using reclaimed wood, but I like the thought of being more green as a company. Do you know of any lumber companies that supply such wood across America? I’m not seeing anything in my area via Google. Also do you know if such providers generally offer a variety of woods; like walnut, oak, ash, or cherry? Thanks for any help.